Over the last twenty years or so, it has become the custom of the various congregations on our island to offer free hot meals to all comers during the winter months. Currently, all seven days of the week are covered. The meals vary from a fixed menu of lasagna and salad for lunch on Sundays to a chef catered dinner on Saturday evenings to a grand potluck on Wednesdays. Our little congregation provides home made soup and casseroles and dessert on Tuesdays. The suppers draw from a varied population. Some folks are homeless. Others are young families struggling to make ends meet. Still others are alone and in need of the social contacts. Many are seniors who don’t enjoy cooking for one person. The one thing all the community suppers hold in common is that they are open, welcoming places for members of the community to gather throughout the gray winter months regardless of what draws them. Last Tuesday we served spaghetti with meat sauce and a salad augmented by a corn chowder and a rice and bean casserole contributed by two of the guests. Following the meal, the clean up has also become a community thing. 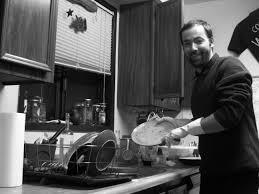 Guests bring their dishes to the kitchen. Some volunteer to scrape. Others to load the dishwasher. Still others put the folding chairs away and store the tables until the next time. Often a sense of joy and “family” floods the atmosphere. After dinner one of the guests joined me in the kitchen, eager to scrape dishes for me to rinse prior to loading them in the dishwasher. A three day stubble, multiple layers of clothing, and a sweet uncertainty about whether he had a place at the table hinted at his possible life circumstances. He remarked about his gratitude for a hot meal. I told him I was happy that he had enjoyed it and that I was glad he had come. He said he had traveled around a lot and eaten in a lot of places, but he had never felt welcomed until he decided to try out the community suppers. He innocently marveled at how kind people were, and how they made him feel at home. He said he didn’t always know that churches were places where he would be welcome, but he thought that there was something in the Bible about being kind to strangers. I had to turn my attention to the dishwasher so he wouldn’t see tears welling up. Over and over again the charge of our sacred texts is to welcome the stranger. We are admonished over and over again: You shall not wrong or oppress a resident alien, for you were aliens in the land of Egypt. (Exodus 22:21) Both the command and the rationale are given in the same sentence. We have all been strangers at one point or another in our lives. The importance of remembering what that feels like needs to be connected with our compassion for the stranger we meet at any moment. Out of curiosity, I consulted Webster for the meaning of the word “estrange.” It means to remove from customary environment or associations; to arouse enmity or indifference where there had formerly been love, affection or friendliness. So much of our global public discourse these days has to do with the question of “what to do with the stranger?” Even on a small island with a relatively intact sense of community we cannot escape the challenges that come with stress-filled movements of so many human beings who have literally been estranged - removed from their customary environments by war, persecution, hunger, threats of slavery , poverty, or homelessness - and now by increased rigor in enforcing immigration laws, and by the threat of deportation. The less than compassionate response to the stranger is fear, indifference, and increasingly, enmity. We have become strangers who estrange others. The ancient text of Genesis tells us that the patriarch, Abraham, was sitting at the entrance of his tent during the heat of the day when three strangers approached him. 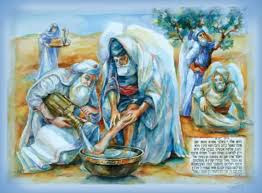 He offered them water, saw to it that their feet were washed and ordered that a feast be prepared for them. There is a tradition that Abraham’s tent was open on all four sides so that a stranger would not have to search for the entrance in order to find hospitality. The stranger was not to be feared and rejected, but welcomed and made to feel at home. I had to reflect awhile on the meaning of the tears I felt welling up when I heard my new dish-washing partner wonder at how welcome he felt in our little church. I wondered why he was surprised; wondered why he couldn’t just take it for granted that he would be welcomed in a church. I don’t know where his travels have taken him or what he encountered along the way, but it was clear to me that he had not always encountered hospitality from some of those most responsible for offering it freely. I went to bed with a little prayer of gratitude. Maybe it was only spaghetti with meat sauce, a bit of laughter and fellowship around the table, a little shared labor in the kitchen after dinner - - but at least we were doing something right. I'm thinking about fathers. I just finished a short story by a writer who was disappointed by his father. His father was abusive and died young from too much alcohol. Years later, the son was contacted by one of his father's war time buddies wanting to know about his father's life. They began a correspondence. Soon a picture arrived of the four Navy buddies at a bar with the son's dad smiling boyishly in the middle of the pack. Eventually the correspondence led to a meeting with the three remaining war time buddies; three seniors around a kitchen table with the one middle aged son. In the reunion picture shared with the story, the son took the father's place in the line-up. 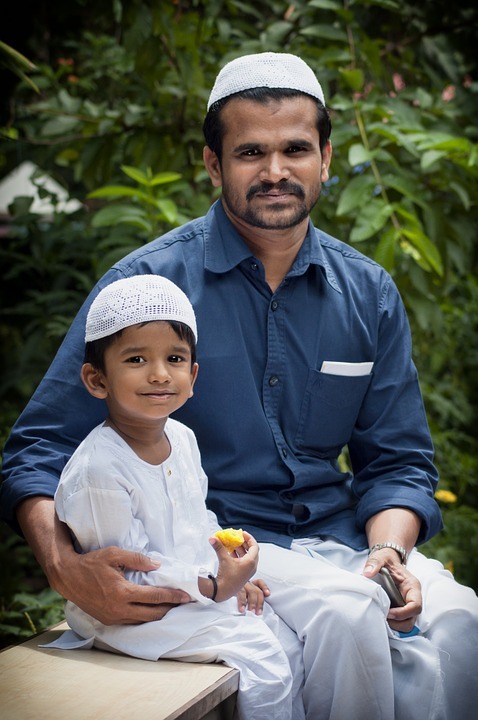 The story ends, "And I am in my father's place." Are we sometimes destined to do that as sons? 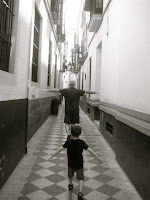 Do we take our father's place? I've considered myself fortunate as I've had several father figures in my life, male mentors that were there at the time I needed them. They weren't a replacement for my father, but they modeled a different way of being male in the world that could be integrated with early family experiences and personal genes. There was Randy and Ken, who both taught me how to find the words I needed and to speak with confidence. There was Ed, who helped me learn how to respect rather than conquer a mountain top and Richard who showed me what patient and untroubled crisis management looked like. There was Bob, who modeled how to balance joy with pain, laughter with suffering and be a truly welcoming neighbor. There was Harivalah, who instructed me in what justice and service looked like and Ramachandran who showed me the color of wisdom. There was a second Bob, who always had my back, even when I probably didn't deserve it. And there was Narayan, who made me recognize the dignity and integrity of Truth. They were all my elders, like my father. They were all instrumental in shaping who I would become. When I think about it, I really have taken their place in a world that needs what my father and each of the others had to offer. I've tried to integrate a piece of them into my own space in life. Most of them are gone now, so someone has to take their place, don't they? How fortunate for me! How privileged to have so many male models when many young men have none. It makes me wish that all men could be elders and mentors, as well as parents, to younger men. Whether it's volunteering as a big brother, coaching a sports team or working with a church youth group; young men need male role models, beyond the primary one at home. And they need the kind of father figures who can share the best of what it means to be male with them. Another wish I have for men is that they could be more involved in the birth process. It is so intimate for mothers and usually so distant for fathers. It makes one wonder if that's why the male parenting role is often the distant, authoritarian one ("Just wait till your father gets home. "); with the mother alone for nurturing and comforting the children. And it makes me wonder if the absent birth father from the creation of life, might also be a reason for the seeming male ease with the taking of life. Men simply don't know, intimately and physically, what it takes to create life. Usually the male role is finished quickly. Maybe it takes nine seconds, not nine months. My major research paper in Seminary was on "Human and Divine Fathers." It was a study of Jonathan Edwards and William Adams Brown. My interest was to see if there was a fatherly resemblance. Does one's human father influence one's conception of God, the divine father? There weren't any clear conclusions from the paper, although Edwards was fertile ground for further exploration. Consider his well known work, "Sinners in the Hands of an Angry God." Without certain evidence, I'd still make a generalization. Most authoritarian human fathers help create authoritarian conceptions of God. You need especially loving and nurturing mothers or lots of father figures to balance the scales and give God a bit of grace, a bit of forgiveness, some humor and love. And authoritarian males like not only sons who obey and Gods who have strict codes of discipline, but also rulers who carry a big stick. Compassion is not their forte and punishment is understood as justice. Unfortunately for sons and nations, confined to authoritarian father conceptions of divinity, they don't know that God is so much larger and glorious than those limited realities. All our Godly metaphors pale in comparison to: "When I look at thy heavens, the work of thy fingers, the moon and the stars set in their place by thee, what is man that thou shouldst remember him, mortal man that thou shouldst care for him?" Or, as 1 John says so well and simply, "God is Love." So apparently the U.S. is going to build a $12 to $15 billion dollar wall on the southern border. Our newly elected President insists that it will stem the flow of illegal immigration, keep us safer and be part of the economic plan to make America great again. Along with the executive order to build the wall came further directions to stop any refugees coming into the country from several nations, where we have actively or surreptitiously supported the wars that made them refugees. Oh, and Muslims are not welcome. Apparently it is a secret in some circles that war creates refugees; that war gives rise to extremism; that arming other nations means they often use those arms against the innocent; that interventionist and economic policies on the part of the U.S. give rise to people fleeing their homelands, like from Honduras, El Salvador, Guatemala and Mexico. And besides, it must be a secret to some that walls don't work! The Great Wall of China is now a UNESCO World Heritage Site. It was built to keep those barbarians from the north at bay. It had its ups and downs over the centuries but eventually, in multiple instances, the unwanted hordes found ways to break or bridge the wall. On the other hand, the wall has often said more about the rulers of China than the potential invaders. 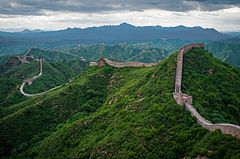 Historically, the wall has come to symbolize the resistance of China to outside influence and the efforts of leaders to control the Chinese people. It's interesting that now, where guards looked out from their towers, tourists scan the horizon in both directions. Building a wall to keep others out often works against the wall builders and keeps them walled in. There's an interesting example I came across reading about the origins of the Thanksgiving hymn, "Now Thank We All Our God." The hymn was written by Martin Rinkart, a Lutheran pastor in a small village in Saxony during the time of the Thirty Years War. Floods of refugees took shelter within the walled city of Eilenberg where Rinkart lived. The Swedish army laid siege to the city and plague, famine and fear followed. In time, Rinkart was the only pastor left, conducting as many as fifty funerals a day. Eventually, he was the one who left the safety of the city walls to negotiate with the enemy and bring the siege to an end. But the wall I'm most familiar with, because it's a symbol from my generation, is the Berlin wall. Here we had a wall separating a country, and separating citizens and families from each other. 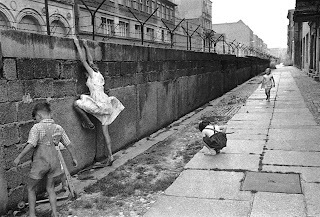 Before the wall was constructed in 1961, over 3 million East Germans ignored emigration restrictions and fled from the Soviet Union to West Germany and then to other Western countries. After the wall was constructed, from 1961 to 1989 when it fell, 139 people were killed or died at the wall. They ranged in age from a 1 year old child to a woman of 80. The wall didn't work. People risked life and limb to be with loved ones and escape oppressive state government and the wall was eventually torn down with great jubilation. When our oldest grandson was small, he would watch Veggie Tales on our television set. One of the tales we had was about the way the Hebrew people were able to bring down the walls of Jericho. The walls came down because Joshua and the others followed God's instructions to the letter. It took seven days with seven priests with seven trumpets leading the Ark of the Covenant. And on the seventh day they circled the walls seven times and the whole people gave a great shout … and the walls came down. Each time our grandson watched that video, I always had to reverse the tape several times so he could examine that sequence and the falling walls. It was as if he was memorizing the process, fascinated by the magic of it. The walls of Jericho failed in the face of God's covenantal people. 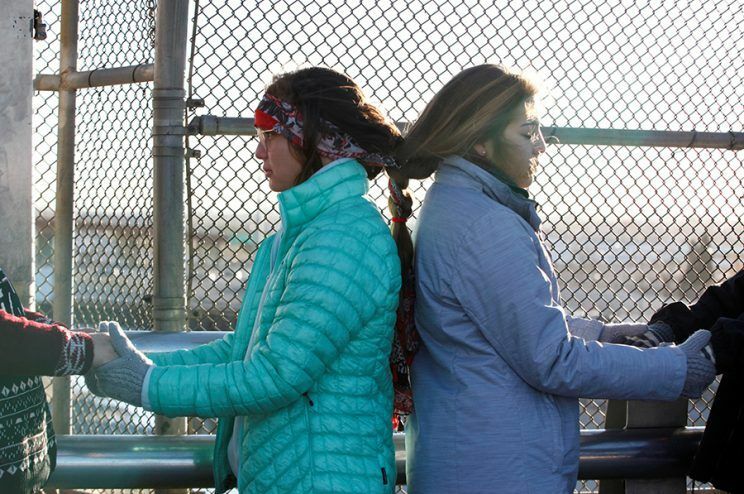 I read a wonderful story the other day about 50 women who met on the bridge connecting Mexico and the U.S. They were from both countries and as a symbol of their relationship and connection with each other they braided their hair together or tied their scarves together. Maybe if we provided our U.S. young with goals and life meaning beyond money and drugs, the demand for drugs crossing any border would disappear. And if we treated countries like Mexico with respect, instead of exploiting them with extractive industries that pillage the land and endanger their water; and if we had physically willing and able workers to tend our fields and farms and factories, roof our homes and landscape our lawns, there would be little work and incentive for the "undocumented." Maybe with the life affirming wisdom of the women on the bridge and the courage of people of faith called to follow the commandments of God, not governments, we will find a way to break down the walls that some would use to further divide us from our neighbors.